Eniva Minerals for Life® Cal-Mag Liquid Concentrate is a dietary supplement of the Cell-Ready® minerals CALCIUM and MAGNESIUM supplements in a proprietary nutrient delivery system. The natural APPLE flavor offers a tangy and refreshing taste. 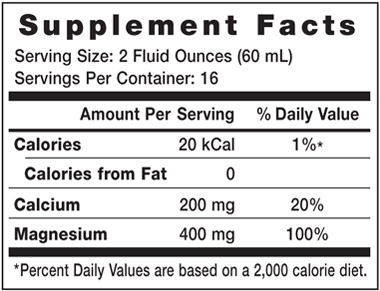 This cal-mag liquid offers support for a healthy skeletal system. Calcium and Magnesium play many critical roles in the bod. This calcium magnesium supplement support strong and healthy bones, and they also work together in the formulation of adenosine triphosphate, the key form of biologic energy. * Getting the correct balance of these important nutrients, however, is critical for optimal physical functioning. Eniva Cal-Mag combines these minerals in the correct ratio, approximately two parts magnesium to one part calcium. In proper balance, the body better absorbs and assimilates the calcium it needs. By having calcium and magnesium in one balanced solution, Eniva ensures that you'll deliver your body the maximum benefits from both minerals. MAGNESIUM is the seventh most abundant mineral in the earth's crust and may be one of the most important nutrients for humans. It is an essential nutrient that is required for many biologic functions, including more than 300 enzymatic reactions. One of magnesium's most important functions is maintaining the function of the nervous system and neuromuscular transmission. * In addition, 50-60% of the magnesium in the body resides in bone. Magnesium works closely with calcium to help promote healthy bones. The purer the water the more efficiently minerals are activated into their electrically charged ionic state. Eniva uses OHM® water (multi-step purified water) in a unique proprietary process at Eniva's government-inspected manufacturing facility, yielding an advanced aqueous form of copper ions (Solutomic) in sparkling clear solution for quicker absorption than tablets or capsules which must first dissolve in the digestive system before being absorbed. Ingredients: Purified water, malic acid, citric acid, magnesium (from magnesium citrate, and/or magnesium malate, and/or magnesium sulfate, and/or magnesium chloride), natural apple flavor, calcium (from calcium citrate, and/or calcium malate, and/or calcium chloride), stevia leaf extract, sorbic and/or benzoic acid(s) (protect freshness). Directions: 2 ounces daily (60mL). Shake well before using. Recommendations: May combine with 8 ounces of water / juice. Caution: Do not consume if tamper resistant seal is broken/missing. Do not consume if allergic to any components found within product. As with all dietary supplements, contact your doctor before use. If taking prescription medications, have an ongoing medical condition, are pregnant, nursing or under age 18, consult doctor before use. Isolated minerals or nutrients are best taken as part of a well balanced diet and broad supplement program. KEEP CAP TIGHTLY CLOSED. KEEP OUT OF REACH OF CHILDREN. I sleep more soundly after taking CalMag each evening before bedtime. The flavor is refreshing as well! Since I started taking my Cal-mag I have really felt better overall. I'm sleeping better and just feel less lethargic. I especially love the flavor. Nice to find a product that does what it says. Taste great, refreshing. I'm excited about taking this product. I've heard it can help my bones be strong. Excellent product with a very delicious taste. I find myself enjoying this as a beverage. The gentleman who assisted me in establishing my autoship is as kind and yet professional a customer service person as I have ever had the privilege to talk to. He represents the Eniva company with distinction. I really do love the taste !! !